Being a Solo Pastor is difficult work. I can relate. The same situation is frequently the case in churches all over the world. Many (if not most!) of the pastors in local churches are “solo pastors.” The vicious cycle of operating Sunday-to-Sunday can be overwhelming, and the Solo Pastor barrier can feel like it can never be overcome. What you may not realize is that the one big, gigantic, humongous difference between being a solo business owner and being a solo pastor is that pastors already have potential staff in our churches, but all too often choose not to “employ” them! Let me clarify my terminology. For the purposes of this article, I make no differentiation between a staff member who gets a paycheck from the church versus one who does not. The subject today is breaking the solo pastor barrier, not how to finance a larger paid staff in the church. This topic delves into two healthy-church ministry functions that we at The Malphurs Group deal with all the time: mobilizing the congregation for ministry and leadership development. They have to go together. Mobilization without leadership development is like herding cats; lots of movement, not a lot of progress. Leadership development without mobilization tends to provide a lot of plans without a lot of progress, and frequently a staff-heavy organization that begins to find paid-staff costs unsustainable. The first thing a solo pastor must do is envision their church with more than just them doing the work. God did not design the local church to have one leader do all the ministry and a group of passive recipients take it in. Look at the progression of Jesus’ ministry. He is baptized (Luke 3), begins to preach (Luke 4), calls the disciples (Luke 5), sends out the twelve disciples (Luke 8), and then sends out the 72 (Luke 9). We see in Ephesians 4 that God’s intention for the church is that the leadership gifts be used to “equip the saints for the work of ministry” until we all reach maturity. If your Vision for your church does not include activating the whole congregation for ministry, it’s time to revisit your Vision! Ask God to open your eyes to the leaders that already exist in your church. How well do you know your people? Have you perceived their gifting through your relationships? Have you served alongside them already and seen that they could have done some things without you? This may be one of the biggest oversights in the church today when it comes to engaging people in ministry. Many people are willing, but do not know where they may fit in and have not been asked to participate. Many in the church believe that they are not “qualified” to serve in the church. They may feel like their past is keeping them from ministry, or they may feel that ministry is only for professionals. You may be surprised how many people simply need a tap on the shoulder. Also consider if you only think of the same 20% of people when you need help. How can you get outside of your “usual circle” to address leadership needs? A mobilized congregation is an educated congregation. You could start off by preaching through Ephesians 4. Unity of the body of Christ includes sharing in the work in which we are all gifted in special ways. People do not just come to this understanding on their own! Most think it is the pastor’s job to do everything in the church. They need to be taught differently. Once this general understanding begins to permeate, then a practical mobilization process needs to be established with people discovering their spiritual gifts and being deployed. If you’d like to learn what a mobilization process looks like and how to create one, you can access free training and tools on this topic here. Don’t put yourself in the position of overseeing every volunteer or ministry. You must start by entrusting a select few with authority over some things and the oversight over those involved in doing those things. Think about Jethro’s wise counsel to Moses in Exodus 18 and how the Apostles dealt with the food distribution crisis in Acts 6. If you’re wondering what it might look like to implement levels of leadership, you can register for our free, upcoming webinar on Leadership Pipeline Design here. By modeling trust through delegation and inspiring your managers, you’ll begin to develop them into leaders themselves and helping them increase in capacity. Be open-handed with your ministry. Christ didn’t hold onto his ministry for himself (even though He is God! ), he handed it over to those he trusted and trained. He accepted that they would make mistakes, and was willing to let them happen because it was the only way the Church would grow once He ascended into heaven. God has a vision for your church and it involves the multiplication of your leadership. Envision your church being all that it can be with everyone working together. Pray that God will lead you to the first ones among you to move you from the work of one to the work of many. Ask them to come alongside you in this great calling to bring the Gospel to the nations. Train them well in God’s word and work. Stratify leadership by setting up managers to use their gifts, and lead them well by the inspiration of Christ and the great work He set before us to do together. Being a Solo Pastor can be a difficult job, but it does not have to be lonely. 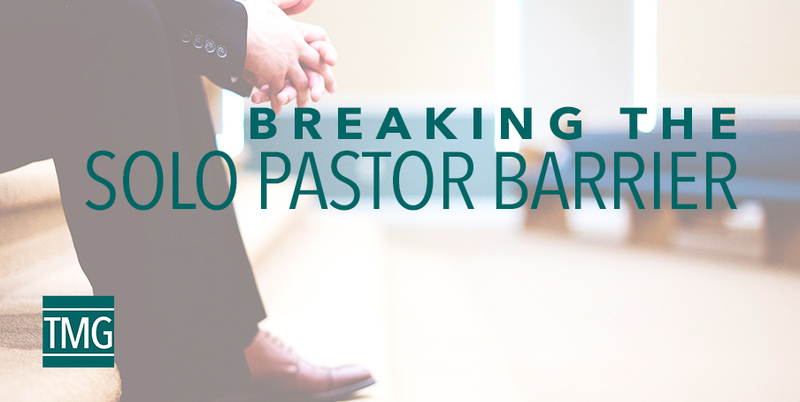 To break the Solo Pastor Barrier, you need only begin by inviting more leaders into ministry. By God’s grace and your commitment to the process, your team will continue to grow.